The screensaver would take the form of moving pictures, patterns, text or photos – making the screen appear “active” even when it wasn’t in use. Many people used custom screensavers of popular culture icons, collages of photos or specific corporate issued ones on their work computers. Screensavers can transform idle, blank screens into digital billboards all over your organization, showing text and images that reinforce your marketing, branding and communications campaigns. It’s a great way to reach your employees where they spend a large chunk of time – right at their desks. It’s also a visually appealing and less intrusive way of communicating and looks good when visitors and clients see your employees’ screens. The benefits of using a corporate screensaver include being able to relay information to everyone in the company at once, getting around the problem of email overload to send messages to staff, having a more dynamic way of communicating to suit different learning and communication preferences, and the ability to build hype around new initiatives. Key messages that reflect any internal or external communication campaigns you currently have underway. Reminders about key dates such as deadlines for projects, payroll cutoffs, pay dates, holidays and so on. Information about education and training opportunities. Reminders about emergency procedures including maps, evacuation routes, assembly points and so on. Information about cyber security awareness. Important phone numbers such as IT help desk. Photographs of staff, your business properties, your products, logos, or any other images that reflects your brand and tells the story of your company. Workplace health and safety information, such as tips to be safe in the workplace and reduce hazards, reminders to move/stretch/exercise, how to report hazards etc. Information on any policies and procedures. Information about your company’s products and services. Interesting facts, figures, statistics, trivia etc related to your company or to your industry. Your corporate vision, values or other motherhood statements. When you invest in DeskAlerts as your company’s internal communication software solution, one of the many add-on features is the ability to deploy custom corporate screensavers to all your employees computer screens that complement your other internal communication efforts. 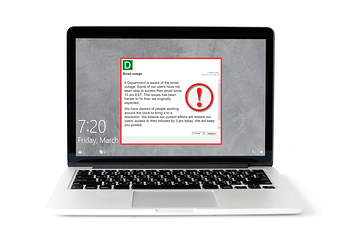 You can send dynamic, vibrant, custom screensavers that all your employees will see. You can even send custom screensavers to niche audiences such as specific offices or work teams that have unique messages. Upload new screensavers in advance to appear at specific dates and times so that they coincide with other communication efforts you are rolling out.